Visitors to your website come for different reasons and are interested in different aspects of your products. To ensure that your content is primed to resonate with your audience members, it's important to know as much about them as possible – not just demographic parameters like age, profession, city of residence and income level, but also their drives, tastes, pet peeves, values, media consumption preferences and the ways in which they go about making decisions. This is where buyer personas come in handy. Personas are dossiers that describe fictional people who symbolize your ideal customers. You can compile these dossiers based on interviews with current clients and other information available to you via analytics platforms. When you have detailed persona documents in place and consistently update them, you're in great shape to maximize the relevance of your marketing content for the people you want to do business with. Thankfully, HubSpot has integrated personas into its product suite, enabling inbound marketers to efficiently optimize messaging for intended audience members – and to customize your website's user experience for each one of your personas. Indeed, the success of your inbound marketing efforts depends on effective leveraging of personas throughout the nurturing process. You don’t want to send irrelevant emails, or serve up irrelevant web content to your prospects, as this suggests that you don’t understand them and their pain points. Instead, you want to target each audience group with content that resonates with it and keeps people coming back for more, until they become customers. Targeting content to specific personas sounds like a good idea in theory, but how do you pull it off in practice? It may seem like a complex undertaking, but the HubSpot COS simplifies the process tremendously. Once you have done the research and outlined your personas, click on “Create new personas” in your HubSpot Dashboard. Enter a name, photo and important attributes into the persona profile. Then add internal notes on the roles, goals and challenges of this particular persona, and you're ready to get going. If you haven't created them yet, you can download these buyer persona templates from top inbound agencies to save time. The next step is to associate each one of your leads with a corresponding persona. You can do this by creating a custom form field, so that when a visitor to your site takes action (downloads a whitepaper or subscribes to your newsletter, for example), he or she is asked a question that helps the system to identify them. 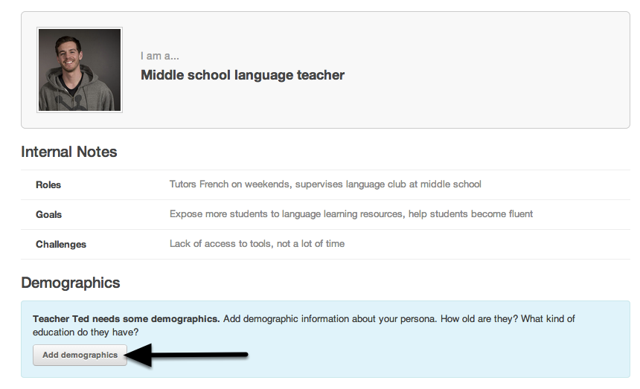 Based on a prospect's answer to this question, he or she will be associated with one of your persona profiles. The question that you ask can be different for each action taken, so when a lead fills out multiple forms on your site, you can receive more detailed information about him or her. Contacts can also be added manually, so offline interactions can be used as well. Once you have your current customers and leads linked to your persona profiles, you can pull accurate information about their demographics. Gather this information from their answers to your form questions, their social media profiles, Google searches performed through the HubSpot COS, phone interviews or in-person discussions. Add this information into the persona profiles, and add interesting tidbits in the “Story” section. This section can include details like hobbies, where they go for information and how tech savvy they are. With your personas up and running, you can start to use them to target your messaging. The persona dashboard will show you how many leads you have of each type, and how far along the conversion funnel they are. Clicking on any of the numbers will provide you with a list of contacts for that persona. You can determine which content, landing pages and calls to action each group sees on your website and send marketing emails geared specifically to one group or subgroup. For example, you can send an email only to marketing-qualified leads who are CEOs of their companies, or only to current customers who work in a US-based office. You can also choose to monitor a specific group on social media to find out what their interests are or what challenges they seek solutions for. The power of the HubSpot system is that it automates all of the hard work. It takes the dream of segmentation and makes it a reality for marketers, without having to create complicated spreadsheets, without having to pore through lots of confusing data, and without having to use multiple tools just to accomplish one task. Once you've done your initial persona research, HubSpot does the rest. It keeps track of personas, assigns new leads where they belong and lets you view and segment each group. Creating actions for a specific group is as simple as the click of a button. Customization in HubSpot was created especially to enhance marketing segmentation, so all the tools you need are available within the COS. Set up your marketing personas now, and take your marketing to a level beyond anything you have done before.